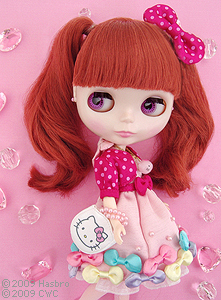 Hello Kitty + Blythe Dolls = Creation of Cute Collaboration? As I have mentioned previously I believe the Hello Kitty and Blythe Doll brands do evoke some of the same views and opinions, and are reflected culturally through Kawaii. As my research develops I will talk more about this subject and why I think they share similarities; in particular the aesthetic characteristics like their large heads fits into the images used in Manga and Anime drawings. 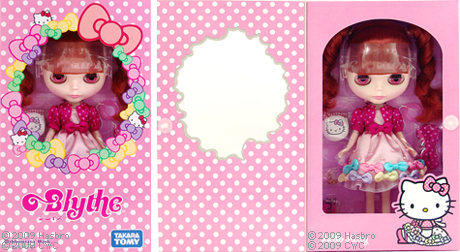 As we know Hello Kitty is predominantly portrayed as very sweet innocent character, as are most Blythe dolls. 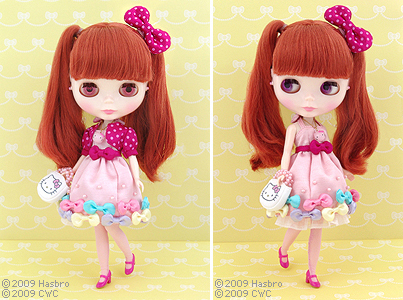 Although both Hello Kitty and Blythe dolls can be dressed up to show different emotions I would say innocence is important to both brands. Manga characters typically have large eyes, which helps to portray their emotions; the characteristic style of Anime/Manga was developed in the 1960’s by Osamu Tezuka. It would be interesting to find out if the original designers behind Blythe dolls had been influenced in some way by Anime styles when they designed the dolls in the 1970’s. 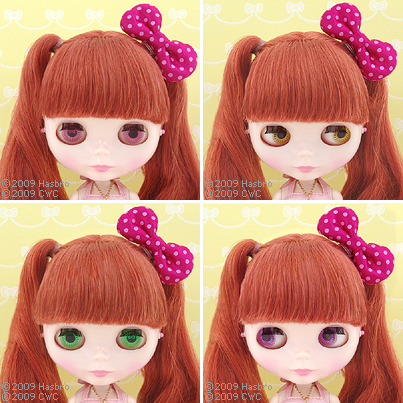 I would say in the case of Blythe dolls the large eyes are reflecting Bambi-esq qualities of innocence and cuteness, although as we know the dolls eyes were the reason for the dolls going out of production. The large heads and eyes of the dolls apparently scared children. The comparisons between Blythe dolls and the Japanese Street fashions observed in the Harajuku district of Tokyo are very similar, and I wonder whether Blythe has become a poster girl for the many of the street styles. As my research develops I am sure I will be able to comment further on the views I have expressed above. This entry was posted in Blythe, Collabrations, Hello Kitty and tagged 35th Hello Kitty anniversary, Blythe Dolls, collaborations, Cute, hello kitty blythe doll, Hello Kitty Dolls, Hello Kitty products, innocence, kawaii. Bookmark the permalink.